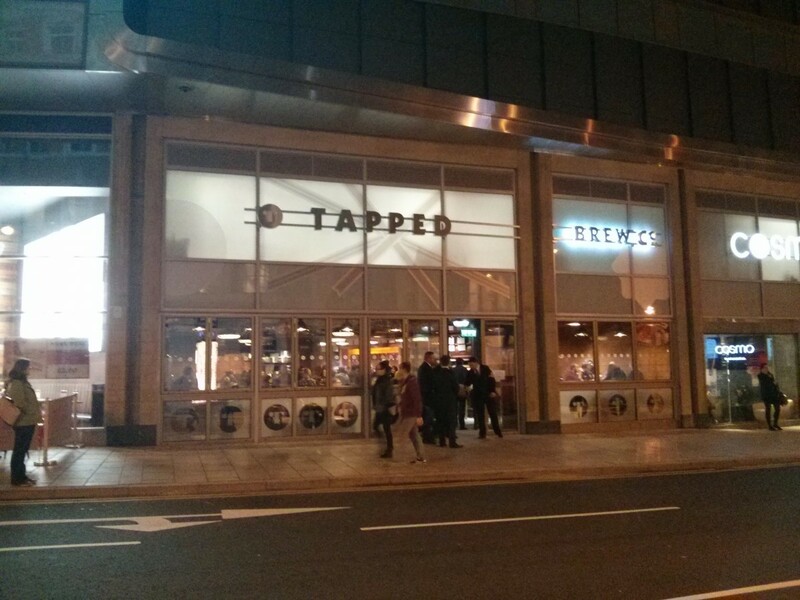 Home » Pub reviews » Tapped Brew Co.
From the outside on Boar Lane you could even miss it. It’s fair to say your Questers have been pretty excited about Tapped opening. Run by the now-legendary pub company Pivovar who run our favourite pubs in Sheffield and York we had very high expectations indeed, and of course we were there on its opening day to see if it lived up to them. It’s like a beer festival. But it’s here every day of the year! 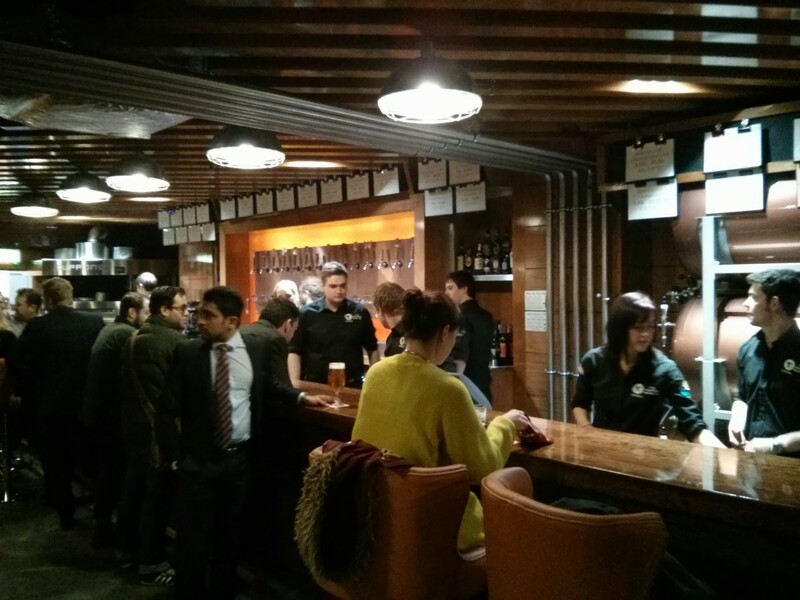 The Leeds offering is billed as an American-style brewpub and it’s hard to miss the 6-fermenter microbrewery along one wall, on display and very much a part of the pub atmosphere. As soon as we got to the bar we noticed Tapped has far and away the best selection of on-tap beer we’ve seen on the quest. Hidden behind the bar (and labelled just like a beer festival) are 13 casks and 14 kegs (including a couple of ciders). 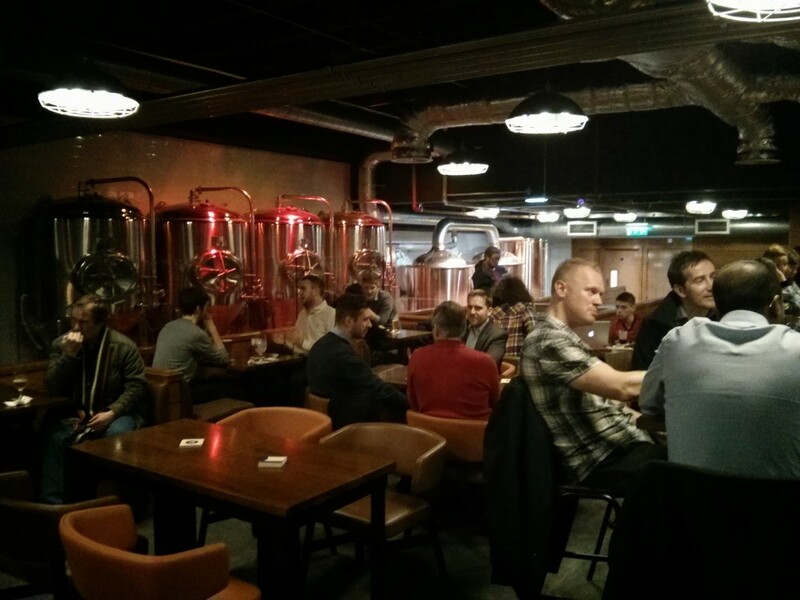 Just like the brewpubs it’s emulating, there is a mix of their own beers (brewed in Sheffield station and on-site in Leeds), and beers from around Britain and the USA, including many of our favourite breweries. Microbrewery on site! You don’t see that everywhere. And if the overwhelming selection of beer on tap wasn’t enough, there’s also a printed menu of 99 bottles to choose from, including lots of Belgian, British and American ales as well as a few others from Europe and one from New Zealand. Prices are very decent indeed, especially considering the quality of beer on offer — something we are usually happy to pay a high premium for. 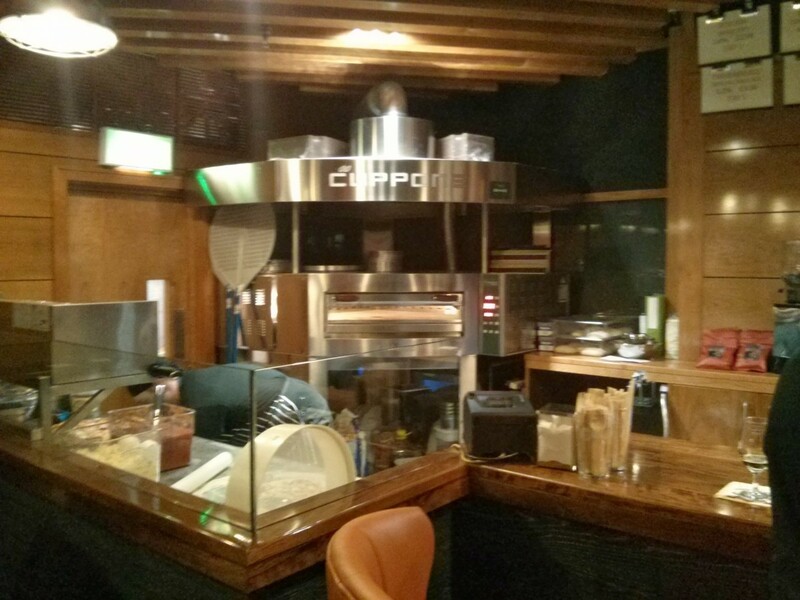 In addition to the beer there’s real coffee and a pizza oven, with 12″ pizzas available in the £8-£14 range. And because Tapped is technically part of the Trinity site, you get access to their free wifi as well. Pretty much everything you need! Fresh pizzas too. Is there any reason to ever leave? The atmosphere is definitely new and shiny and maybe even a little bit sterile, but we’re expecting it to soften up a bit with age. The music when we visited was a selection of indie classics, which is always good for Rich. Sadly there’s no beer garden, but I guess when you’re on Boar Lane you probably want to stay indoors. There were so many staff and everything was running like clockwork even on the first day. All of this is a great sign for the future, and we think Tapped thoroughly deserves its joint first place on our chart. 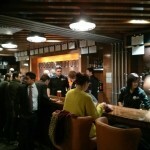 If you are a beer lover, you must go there immediately and make it your new home. Hi, I’m Dan, one of the management team at Tapped. Thanks very much for the positive review, we feel you’ve done us justice. We’re confident, as you predict, that the atmosphere will warm up as time goes by and, in fact, having just knocked off after our first Saturday night, I think I can safely say it was very warm indeed this evening! Oh, just a tiny note, £14 buys you one of my finest, huge 18″ pizzas! We’re looking forward to seeing you there again soon. Denied entry on Sat for wearing Leeds United shirts after travelling over from Blackpool to support the clubs City initiative . Plenty of other places to go drinking and will avoid you from now on. Simple solution Mark, wear a jumper then take it off next when you leave. Not hard is it, unlike saying your supporters group name. 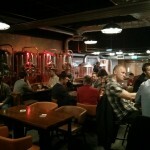 I appreciate that this blog focuses on beer but there’s more to a pub/bar than just the range of ales it serves. 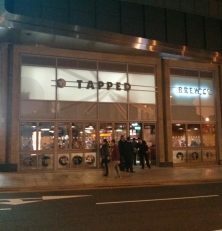 Tapped has zero atmosphere, is massively overpriced and seems crowded even when it’s half empty. One to avoid. 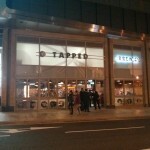 I like Tapped but I do get an impression of very harsh door staff. One reference in the comments here and a couple of other people have also mentioned this to me (not just the football colours rule). I also had a poor experience with one of them who was very arrogant. None the less the bar staff are helpful and the place has a different feel about it. Would visit again. You gave this place the same score for atmosphere as Whitelocks, confirming that you are actually insane. The beer selection here is great, as is the on-site taps. 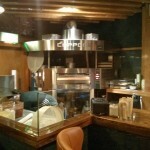 The pizza oven works really well, the staff are friendly and more or less everything about it is nice. Even the price is not too bad. They do some special beers. The décor is very well fitted and doesn’t look cheap. The open windows at the front in the summer are a great idea. It just doesn’t have much atmosphere. Surely even the owners would admit that. It really doesn’t. It’s a businesslike effort, no cosyness, no decorations. Somewhere to go for a nice drink after work, and maybe a pizza, but not somewhere to stay for long. You are, of course, entitled to your opinion. But we are entitled to ours, and there isn’t any need to resort to ad hominem attacks. We are not insane, we just have different priorities to you. It wasn’t meant as an ad homenim, more tongue in cheek if you can forgive my over-enthusiasm! I appreciate these things are subjective and you can’t please everyone. I remain baffled and frustrated that one of the outstanding pubs in the city remains halfway down your list. I understand your different opinion, of course. We visited Whitelock’s 2 years ago before the renovation and (if I’m honest) I found it way too cramped and a little bit smelly in that “we have been doing this since before the smoking ban” sort of way. Our “Atmosphere” rating isn’t just about how a place looks, it’s about how comfortable we specifically feel when we’re in a place, and that has as much to do with how busy it gets and the attitude of the staff as it does to do with the décor.